Out of the 340 recognized dog breeds from all around the world, the Setter breed has long been one of the most likable. 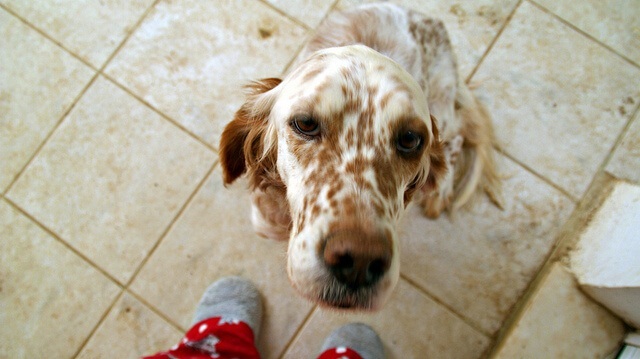 However, of the Setter family, the English Setter is one that remains the most popular and adored. These distinctive and graceful dogs were originally bred in England in the 1800s as hunting and working dogs. So when it comes to optimum nutrition, what is the best diet for English Setters? Keep reading and discover what it is and why you should be concerned about what your pup is eating and how it can affect their health and behavior. If you’re in a hurry check out Blue Buffalo Wilderness Snake River Grill High With Trout, Venison & Rabbit. This is the best dog food for your English Setter since it's high in digestable proteins, contains the essential nutrients of glucosamine, chondroitin and calcium essential for healthy joints and uses no artificial flavors or fullers. What To Feed English Setters? Since English Setters are quite energetic, they should be fed a high-protein and high-calorie dog kibble that will help them maintain those energy levels. English Setters are a healthy breed so they don’t require special dog food or a different feeding regimen, but they should be given kibble that provides them with quality nutrition along with healthy doggy snacks. If you intend on making homemade dog food, aim for as much as 50% protein (you may consider going higher, but we believe that 50% protein is more than adequate). When it comes to commercial dog food look for a high quality meat based feed. The primary ingredient listed should be meat which is a source of protein that is easily digestible. Protein should not come from plants or grains as these are not easily digestable. If the first ingredient is not a meat protein, we encourage you to switch to a brand with a higher meat content. The protein content should be at least 30% from a high-quality meat source such as chicken, venison, beef or lamb. In addition, because this breed is so active, we recommend particularly balanced diets offering a good mix of protein, good fats, fruit and veggies to give those required vitamins and minerals. Depending on the type of English Setter you have, healthy fats are essential to keep their coats from drying out. So aim for foods with whole fish, or at the very least foods that contain flaxseed and/or fish oil. Fats are also required for the absorption of vitamins A, D, E and K and helps make their food palatable. The fat content should be at least 18% and good healthy fat sources include: Chicken Fat, Salmon Oil, Pork Fat or Beef Fat as being the most common. Premium dog food brands also avoid ingredients like corn and wheat, which can cause allergic reactions in some dogs. 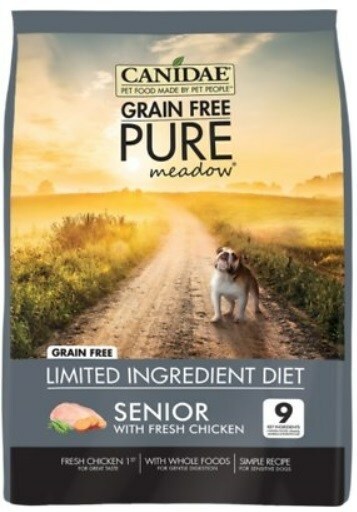 And aside from having real meat as the first ingredient premium brands also have added ingredients like glucosamine for joint health (important since English Setters are predisposed to Hip Dysplasia), along with antioxidants for immune support. English Setters don’t need to follow a special feeding regimen, but you should keep them on a schedule and only keep their food out during meal time. Leaving food out for any dog all day will most likely lead to weight problems and since English Setters gain weight easily, this should be avoided. On average, English Setters, will require more calories than other dogs. This is because they’re an active high-energy breed. Most male English setters weigh between 65 -80 pounds, while most female English Setters weigh between 45-75 pounds. So for an average weight English Setter of between 60-65 pounds the recommended daily calories is around 1300 Kcal/cup reducing to 1100 Kcal/cup for a senior dog. A higher calorie intake of 2000 Kcal/cup is recommended for active or working English Setters. Remember these are just rough indicates. All dogs are different. When working out their calorie intake, you should take into consideration your dog’s age, activity levels, metabolism and current health condition. A good rule of thumb, is to give your dog 30 calories per each pound of weight (for an adult dog). ***As every dog is different and the above are just estimated guidelines for this type of breed, please talk to your vet before making any changes to your English Setter’s diet. English Setters do not suffer from a lot of health problems or hereditary diseases, which makes them a relatively easy breed to care for. One problem that they do suffer from that is common in larger dog breeds is hip dysplasia, an inherited disease that affects the hip joints. Good health begins with proper nutrition. So look for foods with glucosamine, chondroitin and calcium (these ingredients are included in many premium dog foods) which will help promote healthy joints. Keeping an English Setter on a good diet, watching their weight, giving them warm and comfortable places to sleep, and making sure they get moderate exercise can help manage this disease if symptoms start to show. 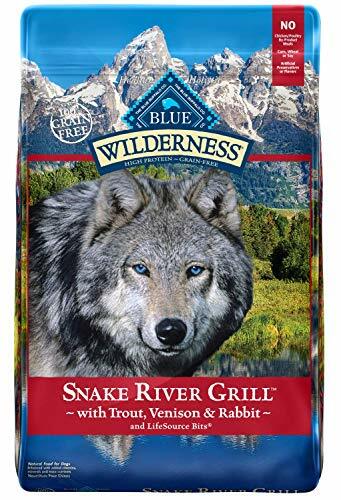 Blue Buffalo Wilderness Snake River Grill With Trout, Venison & Rabbit is a high protein, holistic dog food that gives dogs everything that they need to be energetic and healthy. This dry kibble is grain-free and doesn’t contain any wheat, corn, or soy that can cause allergies and sensitivities in some dog breeds. 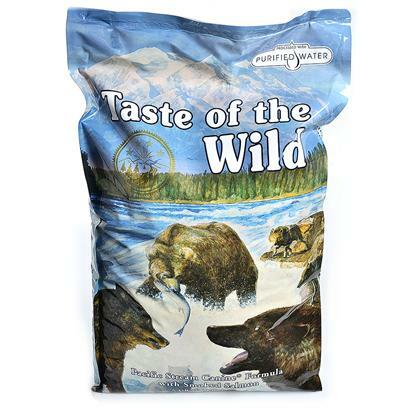 BLUE Wilderness uses trout, venison and rabbit as its main source of protein, along with fruits and vegetables including peas, potatoes, carrots, sweet potato, blueberries, and cranberries. This recipe is made using a precise blend of carbohydrates and calories to make sure that dogs maintain a healthy weight and are getting the best nutrition every day. BLUE Wilderness is fortified with exclusive LifeSource Bits made with vitamins, minerals, and antioxidants. This formula has everything that Setters will need to support a healthy immune system, skin and coat, and strong joints, bones, and healthy teeth. Owners love Blue Wilderness because it has the best ingredients without any artificial flavors or fillers, it's made in the USA and dogs love the taste! Dogs who have switched to Blue Wilderness from other brands have seen improved digestion, less shedding, and shinier coats. 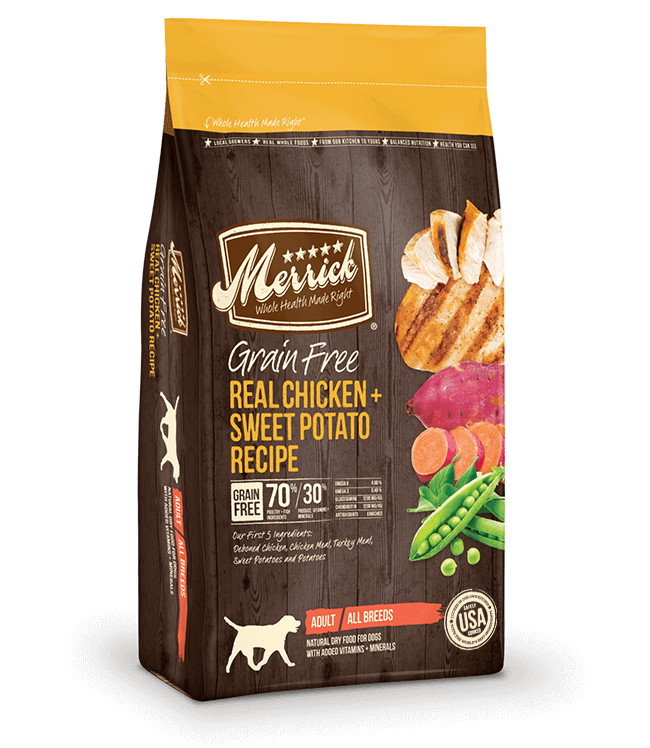 The first ingredient in Merrick Grain Free Real Chicken & Sweet Potato is healthy deboned chicken. This formula is made using 70% protein for energy and 30% fruits, vegetables, vitamins, and minerals to provide dogs with everything they need for optimal health. Merrick Grain Free is fortified with Omega 3 and 6 fatty acids, which are great for supporting dogs’ healthy skin and coat. It also contains glucosamine and chondroitin to help dogs maintain healthy joints. A few of the main ingredients in this dry dog food recipe are chicken, fish, potatoes, peas, apples, and blueberries. One of the great things about this recipe is that it is formulated for all dog breeds at all life stages, and thus a perfect choice for owners who have multiple dogs. Owners love Merrick Grain Free because it is made in the USA using only the best, trusted ingredients. Since it is grain-free, Merrick dry dog food won’t trigger common allergies and sensitivities in dogs. Another winner in our book for good quality and meat based dog food and worthy of your consideration for your furry pet. Taste of the Wild Pacific Stream with Smoked Salmon is our third most recommended kibble and is another excellent, high-protein feed containing ample fats to keep a Setter’s long hair nice and shiny and is palatable too! The primary ingredient in this grain-free blend is smoked salmon (yummy!). Fish is a good source of omega-3 and omega-6 fatty acids which helps promote healthy skin and coat, lower blood pressure and healthy joints. What we like about this formula, is that it is made with actual salmon meat and NOT salmon meal or fish by-products. In addition to the great protein-based source of salmon, other worthy ingredients include: ocean fish meal, tomatoes, blueberries, raspberries, dried chicory root, sweet potatoes, probiotics and a plethora of vitamins and minerals. This dry kibble doesn’t contain any grains or corn which is a good choice for Setters with allergies. This is a tasty food option which your dog will absolutely love! As dogs get older, their metabolism slows down, they naturally become less active and like humans they begin to eat less. So adjusting their food to a lower calorie but high quality protein-based feed is now more important than ever. They also require more fiber in order to improve their gastrointestinal functions. The best dry dog food for older Setters should focus on high-quality protein and CANIDAE Grain Free PURE does exactly that. This formula is also made with 7 to 10 key ingredients to help those pets with food sensitivities. This grain-free kibble’s meat sources are quality high-protein sources such as chicken, chicken meal and turkey meal which will help promote healthy kidneys, encourage lean muscle mass and help maintain optimum body weight. Yummy or what!! As your English Setter gets older their ability to metabolize protein becomes less efficient so hence why we keep emphasizing that the quality of protein is thus now even more important and Canidae Pure has it in ample portions. This dog food brand is a great overall dry dog food for senior Setters or those with a food intolerance. The first thing that’ll jump at you when looking at the Fromm product line is its incredibly delicious recipes that’s even irresistible to a human. Their packaging are top of the line too and you know that this is going to be a great choice of canine cuisine for feeding your best friend. 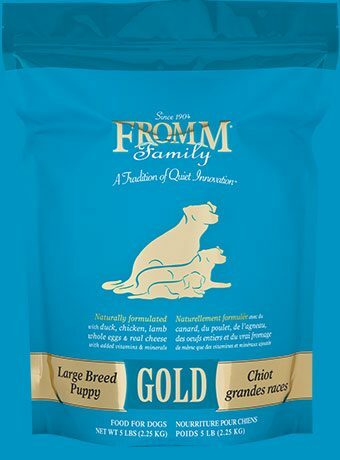 The Fromm Gold Large Breed Puppy recipe main ingredient is duck which is extremely high quality, chicken meal and chicken in addition to menhaden fish meal and lamb- all lean meat sources. It’s easy to see why this a no-brainer choice of food for Setter puppies. Aside from its meat content (the protein content for this particular food is 26%), its use of vegetables and grain is also impressive. Brown rice, oatmeal and barley are the main complex carbs used in this formula which offers easy digestion and is a great source of fiber (crude fiber content is 3.5%). You’ll also see other essential key ingredients in this blend which is vital to a growing English Setter puppy: flaxseed, probiotics, Salmon oil, Chicken Fat and fortified with vitamins and minerals – all associated with a premium and quality dog food brand. English Setters do extremely well on Fromm foods - your pup will love it! So, What's the Best Food English Setters? When choosing a dog food for your English Setter pet, you should look for brands that use natural ingredients and real meat as the first ingredient. Most vet recommended premium dog food brands also avoid ingredients like corn and wheat, which can cause allergic reactions in some dogs. Dry dog food blends like BLUE Wilderness Duck Recipe and or Merrick’s Grain Free Real Chicken + Sweet Potato Recipe are a few great pet owner and vet recommended options for English Setters. These brands focus on providing dogs with natural nutrition that mirrors what they would be eating in the wild, without the use of fillers and other unhealthy ingredients.